Paper Capacity (sheets): 1,100 std. ; 2,300 max. * The optional Envelope Feeder Attachment-D1 is required. *** The optional Searchable PDF Kit-C1 is required. • You must install either the DADF-AB1 or Platen Cover Type P with the main unit. † The Cassette Feeding Unit-AE1 and Cabinet Type-C cannot be installed at the same time. † † Installs on the second paper cassette. † † † The Inner Finisher-B1 and Inner 2-Way Tray cannot be installed at the same time. Δ Requires PCL Printer Kit-AF1. ΔΔ Requires Color Send Kit-Y1. ΔΔΔ Requires the Card Reader Attachment-D3 for installation. ♦ Card Reader-E1 and Copy Control Interface Kit-A1cannot be installed at the same time. Designed to meet the needs of small to mid-size workgroups, the Canon imageRUNNER 2525 delivers high-quality print and copy output and color scanning combined with available sending and finishing capabilities that are easy to use for everyone in the office. Rather than having to choose between a single function printer and an MFP with features you don’t need, the Canon imageRUNNER 2525 includes just the right mix of performance and productivity in a configuration that fits your needs – today and tomorrow. 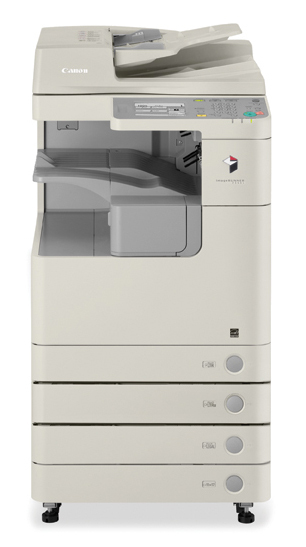 The imageRUNNER 2525 delivers black and white print speeds of up to 25 ppm and scanning speeds of 35/25 ipm (BW/color) for letter-sized documents with the available duplexing automatic document feeder. Offering standard UFR II LT printing, twin 550-sheet cassettes, a large intuitive LCD interface, and internal finishing options, the imageRUNNER 2525 system packs easy-to-use productivity into a new compact form. Knowledge is delivered through documents. Click here to get an all-in-one print/copy/scan solution for your school at Canon's special reduced price.